Highly recognizable, the Siamese sports deep blue, almond-shaped eyes, a chiseled, wedge-shaped head, sleek, tubular body and large pointed ears. The body is muscular but delicate. Its short hair coat contains a mutated enzyme in its pigment that produces its cream colored torso offset by darker points at the ears, face, and toes. The CFA recognizes four “points” or colors of Siamese: seal (black), chocolate (brown), blue (grey dilution of seal) and lilac (dilution of the chocolate). TICA allows more colors, including lynx and tortoiseshell. Females weight between 5 and 6 pounds and males average between 6 and 7 pounds. Regarded as a healthy breed, the Siamese can be genetically predisposed to problems with gingivitis and a liver-destroying disease called amyloidosis. You might wish this breed came with a mute button. Siamese are vocal and demanding, capable of conveying its wants in a range from mews to loud raspy calls. 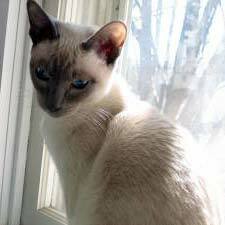 Siamese are also curious, affectionate and athletic. Their vocalization sounds like human baby cries. They love to be around their favorite people and tend to share your pillow at bedtime. Highly intelligent, this breed can be trained to perform commands and tricks and has proven to be a viable competitor in feline agility. Their coats darken with age. Siamese cats are very vocal. Responsible breeding practices have bred out the cross-eyed and kinked tail tendencies. One of the oldest and most recognizable cat breeds in the world, the Siamese traces its royal roots back to the 14th Century in Thailand when it was known as Siam. This elegant breed belonged to members of the Siam royal family who would bestow them to visiting dignitaries. This breed began showing up in Europe and the United States by the late 1800s. The first known Siamese to reach American shores was a gift to First Lady Lucy Webb Hayes from the American consul in Bangkok in 1884. Siamese also enjoyed time in the White House during the Gerald Ford and Jimmy Carter presidencies. Today, the Siamese ranks fifth in popularity among all breeds recognized by the Cat Fanciers Association, the world’s largest breed registry.